One question that is frequently asked from me is if I always "dress up", even when I'm at home. The short answer is "No". The spunky answer is "hell to the no!". But the real let-me-shatter-the-glass-for-you answer is that I change into comfortable clothes the minute that I come home and stay that way until the minute that I have to put "real clothes" on and greet the world. I don't think there's anything wrong with sweatpants or pajamas. In fact, I prefer to live my at-home life in them rather than to wear out my "nice" clothes when I'm not doing anything special. I even have matching sweatsuits. I'm really not kidding. My husband likes to joke around that I look a mob-wife when we're at home. Three things to address that statement: 1. It's probably true (sans the make-up and nails). 2. I don't wear velour ones, okay?! I stick to the regular mono-color athletic sweatsuits. 3. He loves it! If you follow me on Instagram, you may have picked up on the fact that I am ever so slowly inching my way into my Spring wardrobe. But, since it's not exactly warm enough to wear a lot my Spring pieces yet, I've been Winterizing a lot of them with tights and blazers. Two of the pieces that I'm most excited to wear this upcoming season are this gorgeous yellow blazer and this amazing pleated skirt. 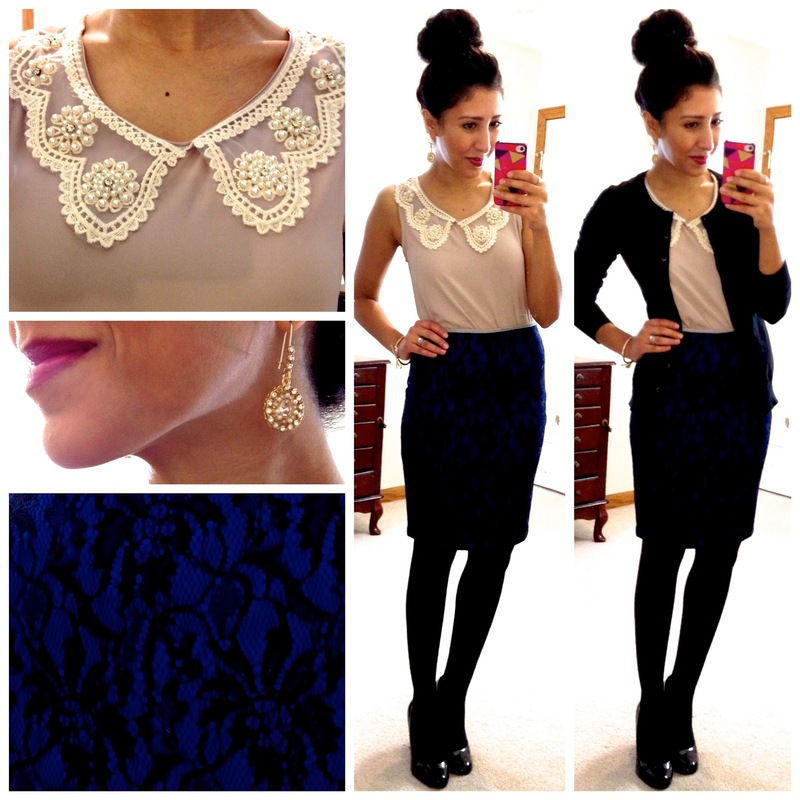 Both pieces are from Teodora B., a fabulous new online boutique that I recently discovered. I am not exaggerating when I say that I seriously want every.single.piece from this boutique. I want it ALL!! I want to wear it to work. I want to wear it out. And I simply just want these delicious pieces hanging right in my closet! 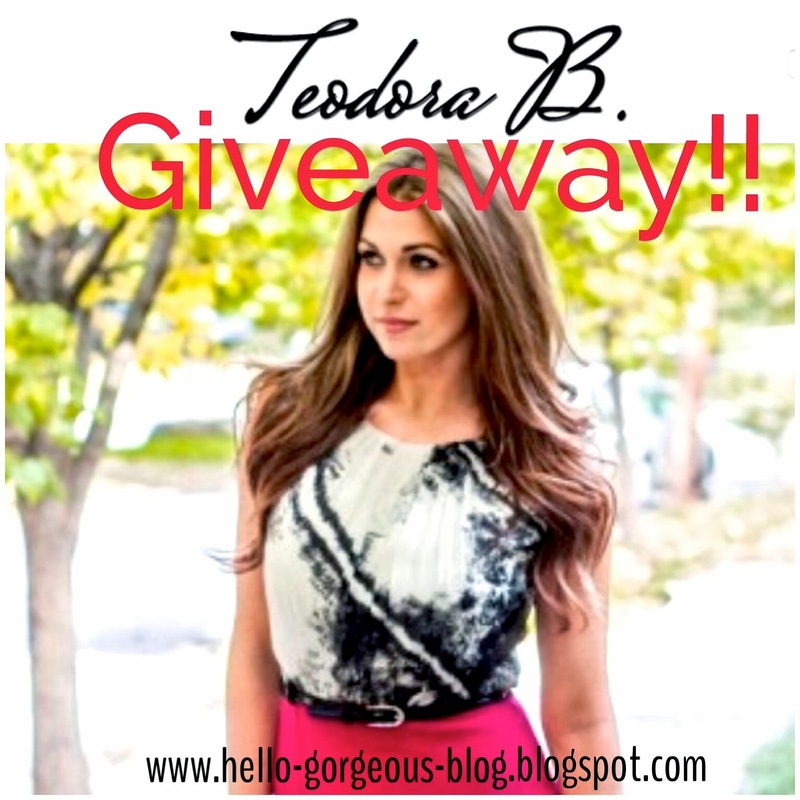 So, I'm thrilled to be teaming up with Teodora B. to host a gorgeous giveaway! One lucky winner will win ONE fabulous Teodora B. item of her choice (up to $100!). Just use the Rafflecopter app below to enter. The small print: Giveaway ends on Monday, March 17th, and is open to U.S. residents only. Winner will be announced on the Hello Gorgeous Facebook page and must claim prize within 48 hours. If prize is left unclaimed within this time, a new winner will be chosen. February and March are by far the most challenging months of the year for me. I can't exactly call them my least favorite months, because let's be honest-- February has Valentine's Day (perfect for this gooey romantic!) and March is the turn of the Spring Equinox and also the Persian New Year. But, what I struggle with in these months is the mental exhaustion/boredom/restlessness that comes from a lingering Winter and the anticipation of a Spring that I'm often convinced will never arrive. During this time, I feel like all the days blend together. And on a strictly fashion note, I seriously get so ridiculously sick of wearing tights! But, I'm too much of a wuss to go bare-legged. In fact, if I didn't wear shorts at the gym, it's entirely possible that I forget what my legs actually look like by the end of March. So, here's to Spring coming sooner than later! 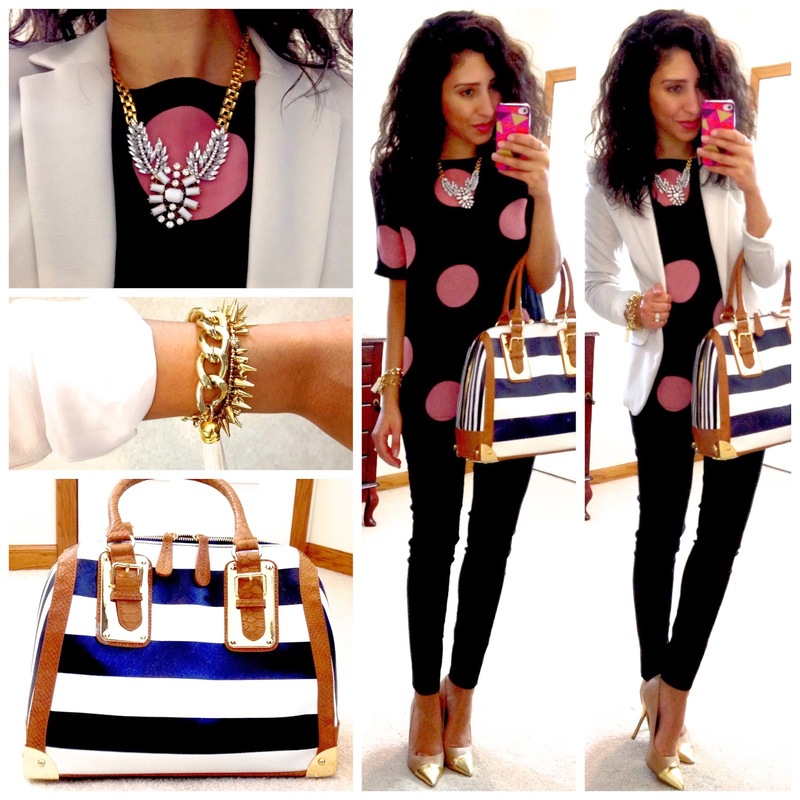 About a month ago, I teamed up with Zappos.com to create a couple of exciting Spring looks for work. I feel a little silly admitting this, but before visiting their website, I was wholly under the impression that Zappos only carried shoes--kind of like an online DSW. Although I was correct in that "zappatos" means "shoes" in Spanish (yay for those two semesters of Spanish in high school! ), I was wrong about the rest. Zappos literally carries everything under the sun! The second thing that I must admit is that I spent the next week or so just browsing through their website multiple times a day because there is just so much stuff to choose from!! 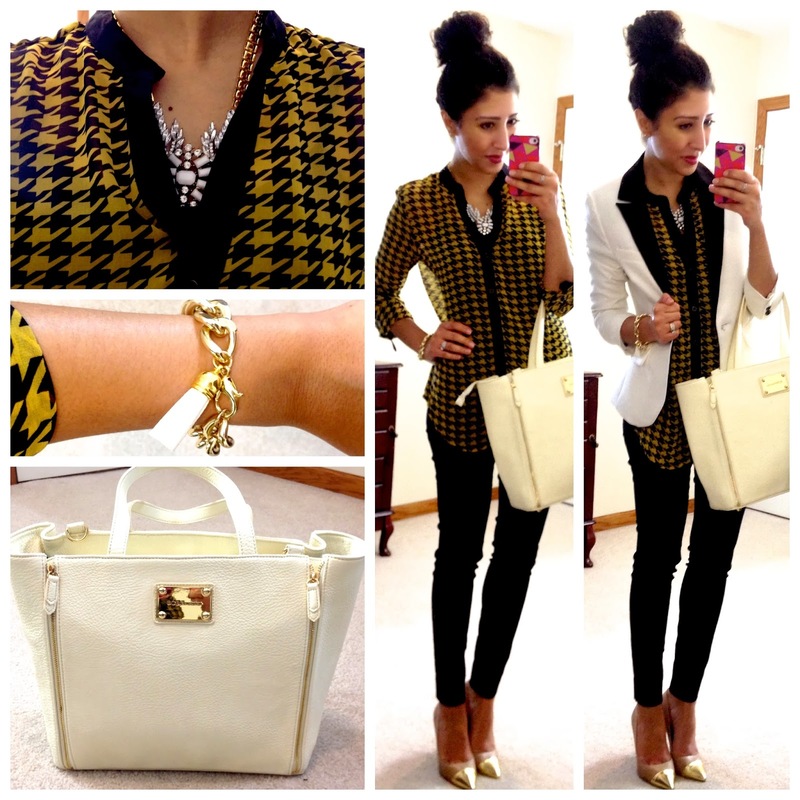 In the end, I picked out two gorgeous tops (Hello, big polka dots and yellow houndstooth!) and two purses, and I couldn't be happier with all of my picks! Since I received them in the mail (the DAY after I ordered! ), I've been using the BCBG purse every.single.day. and I can't wait to wear out the striped Aldo purse, too. They're both so flipping cute, right? !